"I remain ever grateful to Neumann and understand the constant need for assistance. 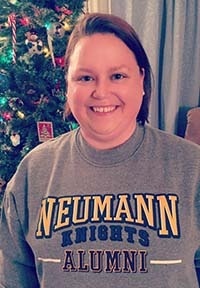 My recurring gift is an ongoing pledge to never forget what Neumann University has meant to me. I had great experiences, both in and out of the classroom. I met people who helped me professionally as an educator and also on my faith journey. I made lasting friendships that have become a very special part of my life. Neumann gave me opportunities to participate in service allowing me to engage with people from all over the world. I hope that my contribution will enable another student to experience the richness of the Neumann community." 2. After choosing the amount you wish to give and where you would like your gift to go, simply select the option to make a recurring gift. 3. You can then choose how frequently you wish your gift to be made (monthly, quarterly, twice yearly, yearly) Please note that the gift amount you choose at the top of the form is the amount your card will be charged on each payment date. If you have questions about the recurring giving program or to alter your recurring gift in any way, please contact us at 610-558-5513.